Two major observances are on the calendar for April: Easter and Passover. It’s a time to get together with family and close friends to eat, remember, give thanks, and celebrate. If you’re searching for some Passover foods and Easter recipes that can help keep things traditional, tasty, and healthy, then you’ve come to the right place! One of the central components of each of these holidays is a traditional meal. Traditional Passover and Easter foods are common, while there are also modern takes available to switch things up a little, if so desired. Whether you’re sitting for a Passover Seder or an Easter brunch, you’ll want to enjoy your food while still respecting the traditions of your culture. Servings: 8 Active Time (Prep): 15 mins. Total Time: 14 hours 50 mins. Place the oregano, rosemary, salt, pepper, and lemon zest in a food processor and process until blended, for about two to three minutes. Coat the lamb in rub mixture and transfer to a rack in a roasting pan. Refrigerate for 12 to 24 hours. 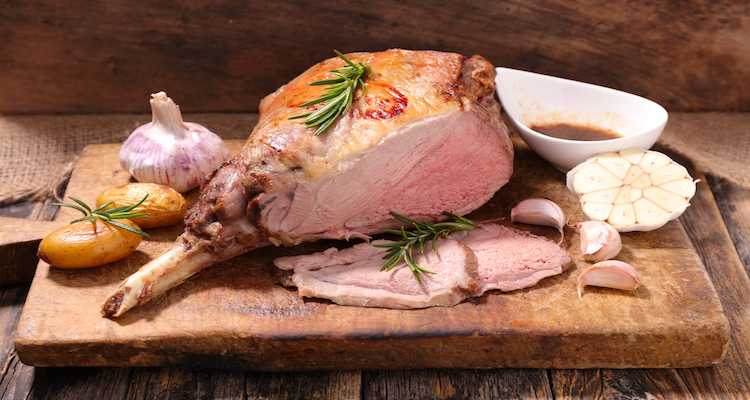 Allow the lamb to sit at room temperature for 30 minutes. Preheat the oven to 450 degrees F and brush lamb with olive oil. Let the lamb cool for 20 minutes before serving. Servings: 8 Active Time: 25 mins. Total Time: 1 hour 15 mins. Preheat oven to 500 degrees F. Place bay leaves, cloves, onions, one tablespoon of vinegar, one tablespoon of olive oil, one teaspoon of salt, and a quarter teaspoon of black pepper in a medium-sized bowl. Toss well. In a large bowl, place beets, rosemary sprigs, honey, one tablespoon of vinegar, one tablespoon of olive oil, one teaspoon of salt, and a half teaspoon of black pepper. Toss well. Tear a large piece of heavy-duty aluminum foil, and place beets in the center in a single layer. Fold the sides of foil over the beets, double-folding on the top and side edges to seal and create a packet. Place the packet at one end of a small, rimmed baking sheet pan. Bake beets at 500 for 15 minutes. While the beets are baking, cut one orange half into six wedges. Squeeze the juice from other orange half (about 1 1/2 tablespoons of orange juice). Trim the tops of the carrots down to one inch of greenery. In a large bowl, toss together carrots, orange juice, orange wedges, thyme sprigs, and leftover olive oil, salt, and pepper. Remove pan from oven. Place the carrot and onion mixtures next to the foil packet, spreading them into a single layer. Return to oven, and bake beets, onions, and carrots for 25 minutes. Let cool 10 minutes; combine veggies and serve hot. So you’ve had a healthy Easter dinner recipeand side, let’s party a little bit for dessert. We won’t go overboard, but there will be a touch of sugar in these portion-controlled pickables! Servings: 12 Active Time: 30 mins. Total Time: 1 hour 20 mins. Preheat oven to 350 degrees F. Place paper liners in 12 half-cup muffin cups. In a medium-sized bowl, whisk together all-purpose flour, whole wheat flour, baking powder, and salt. Using an electric mixer, beat sugar and butter in a large mixing bowl on medium speed until creamy. Add in vanilla, two teaspoons of lemon zest, and two eggs; beat until combined. Keeping the mixer on low, alternately mix in the dry ingredients and milk, starting and ending with dry ingredients, until combined. Scrape the sides of the bowl as needed. Fold in strawberries. Fill the muffin cups with equal amounts of batter. Bake for 18 to 25 minutes, or until a toothpick comes out clean. Transfer to wire rack and allow to cool completely. While cupcakes are cooling, combine confectioners’ sugar, cream cheese, lemon juice, leftover lemon zest, and food coloring in a mixing bowl. Blend with an electric mixer until smooth. Refrigerate for one hour. Spread a full tablespoon of cream-cheese frosting over each cupcake and top with a lemon slice and mint leaf. A traditional Passover Seder plate is the central component of a Passover meal, held on the first night of Passover. It features five or six symbolic foods, each to represent a part—or multiple parts—of the Passover story. Contemporary meals may include other items, and a variety of items are enjoyed on the successive days of observance. Here are few modern takes on traditional foods you can try during Passover. A dish typically served at Rosh Hashanah, gelfite fish also appears on tables during Passover. Serves: 12-16 pieces Active Time: 30 mins. Total Time: 60 mins. Fill a stockpot with the water. Place parsley, thyme, fennel seeds, and peppercorns in a small piece of cheesecloth, tie in a knot to enclose, and add to stockpot. Add the carrot, onion, lemon, wine, bay leaves, and salt. Place a lid over the pot and bring broth to a simmer over medium-low heat. Uncover and simmer gently for 30 minutes. Remove the cheesecloth bundle and discard. Set broth aside. Cut fish fillets into one-inch pieces. In small groups, pulse the fish in a food processor until roughly ground. Transfer the ground fish to a large bowl. Toss in the carrots, onions, zest, fennel fronds, eggs, matzah meal, water, salt, pepper, and sugar (to taste). Mix until combined and refrigerate for 30 minutes. Fill a medium-sized bowl with ice water. Wet your hands with the water as you form half-cup portions (roughly three ounces each) of the fish mixture into round ovals. Bring broth to a low simmer. Add one layer of fish rounds to the pot and poach until the fish turns opaque and firm, about three minutes. Add in the remaining fish and poach until cooked through. Continue to simmer for about 30 minutes. Remove stockpot from heat and let the geflite fish cool in the broth for 20 minutes. Take the fish out of the broth and transfer to a storage container. Pour two tablespoons of broth over the fish, cover container and chill. *To keep things keto, you won’t actually be using matzo balls. Instead, the main ingredient is meat and they will look just like matzo balls! Add stock, ground chicken, almond flour, almonds, garlic, oil, egg, salt, and pepper to a medium-sized bowl. Mix together well. Cover the bowl with plastic and chill for up to 24 hours (and a minimum of two hours). Fill a large bowl with ice water. Dip your hands in the water before scooping the batter and shaping into 1 1/2-inch balls. Place the chicken balls on a plate and refrigerate them. 3. Pour the water in a medium-sized pot and bring to a boil over high heat. Add salt. Add the balls, lower the heat, and let simmer for eight minutes. Put the chicken in a large pot. Add in celery, carrots, garlic, fennel, onions, mushroom, parsnip, bay leaves, and salt. Pour in water and bring to boiling. Using a large spoon, skim film. Pour in salt and peppercorns. Place a lid on the pot, and reduce heat to simmering. Check after five minutes. Toss in parsley and dill, recover and simmer for two hours. Cool and strain through large sieve. Add no-matzo balls and serve. 1 large orange, cut into 1/8”-thick slices. Preheat oven to 350 degrees F. Use the oil to grease a springform pan (nine inches). Use some potato starch to dust the pan. Using an electric mixer, beat the egg yolks on medium speed for three minutes. Add in sugar gradually and beat for another three minutes. Switch speed to low and add in the citrus juices and zests slowly. Next, add vanilla and almond extracts. Turn the mixer off, and sift the cake meal and potato starch over the top. Mix until just blended and place the batter in a large bowl. Clean and dry the mixer bowl. Beat the egg whites until foamy with the whisk attachment. Pour in the salt and beat until egg whites have glossy peaks. Carefully fold into the cake batter and pour into the greased and dusted pan. Bake until a toothpick inserted into the middle of the cake comes out clean, or roughly 50 minutes. Place the cake on a wire rack to cool. Put the citrus slices in a saucepan. Cover with equal parts water and sugar. Bring to boiling and cook, allowing the sugar to dissolve. Reduce the heat to simmering and cook for about 30 minutes. Turn off element and let the slices cool in the syrup. Transfer to a wire rack set over a baking sheet to dry and arrange the slices on the cake just before serving. You can have a traditional and healthy Passover and Easter this month. Try any, or all, of these delicious Passover and Easter recipes, and watch as your loved ones keep coming back for seconds or thirds. Happy Holidays! “Roasted Leg of Lamb with Lemon-Herb Salt Recipe” Southern Living, 2019; https://www.southernliving.com/recipes/roasted-leg-of-lamb-lemon-herb-salt-recipe, last accessed April 15, 2019. “Roasted Beets, Carrots, and Sweet Onions Recipe” Southern Living, 2019; https://www.southernliving.com/recipes/roasted-beets-carrots-sweet-onions-recipe, last accessed April 15, 2019. Casner, C., “Strawberry Lemonade Cupcakes” Eating Well, March 2017; http://www.eatingwell.com/recipe/257449/strawberry-lemonade-cupcakes/, last accessed April 15, 2019. Ringler, R., “You Can Actually Make Your Own (Delicious) Gefilte Fish” My Jewish Learning, September 5, 2017; https://www.myjewishlearning.com/the-nosher/you-can-actually-make-your-own-delicious-gefilte-fish/, last accessed April 15, 2019. Shoyer, P., “Keto Faux-Matzo Ball Soup” Chabad, 2019; https://www.chabad.org/recipes/recipe_cdo/aid/4313782/jewish/Keto-Faux-Matzoh-Ball-Soup.htm, last accessed April 15, 2019. Silver, S., “Lemon Sponge Cake with Candied Citrus” My Jewish Learning, March 24, 2015; https://www.myjewishlearning.com/the-nosher/lemon-sponge-cake-with-candied-citrus/, last accessed April 15, 2019.